In the gold ore crushing plant, gold ore is crushed because the leaching process recovers mostly surface gold and crushing maximizes the surface area of the ore for greater gold recovery. The gold ore crushing circuit is designed to process almost 3,000 tons of ore per hour, approximately 50 tons per minute. Gold ore is loaded into the primary crusher for initial sizing. This gyratory gold ore crusher breaks the rock into 6-inch diameter pieces. Conveyor belts take the broken ore to the screening plant, which runs the ore through vibrating screens to size the material. The optimum size is 0.75 inch diameter pieces. Oversized rock is sent via conveyor to the secondary gold ore crushing plant. When crushed to 0.75 inch diameter or smaller, lime is added to the ore to increase the effectiveness of the process solution. The ore is then conveyed to the load out bin. 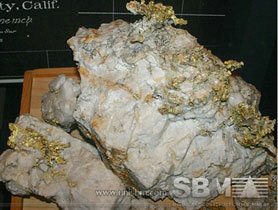 SBM can offer types of Gold ore crusher for mining and beneficiation plant. SBM PE jaw crusher can be used in small scale gold ore mining process. Mobile stone crusher is used in portable gold ore crushing plant. "Experience of cooperating with SBM made our company get on the right track. We really thanks SBM for their professional service."